Ajay J. Kirtane, MD; Krishna J. Rocha-Singh, MD; and Prof. Darrel Francis discuss key data from the trial and its potential effect on patient care and the evaluation of interventional therapies for treatment-resistant hypertension. For the past several years, one of the hottest topics at congresses has been the potential for sympathetic denervation in treating patients with resistant hypertension. These patients have long presented a quandary for primary care physicians and specialists alike, with resistances including nonresponsiveness as well as noncompliance for a variety of reasons. The game-changing potential for interventional options to meet this need has been embraced by members of every vascular specialty, as well as industry, which has seen dozens of platforms in development from companies large and small, and substantial investments in acquisitions and clinical trials. There has also been skepticism by some due in part to increasing adoption of renal denervation in the absence of data from large-scale randomized trials involving a blinded control arm. Questions were raised as to whether enough was known about the patient population, the anatomy and its relationship to both symptoms and outcomes, the safety of the concept in practice, the actual versus perceived effects of the therapy, and how much of a blood pressure drop would need to be observed and for how long. These are the types of reasonable questions that face any emerging, potentially paradigm-shifting therapy, and the reason the results of RCTs are seen as the keys to the future of this device class. With numerous platforms available in some global markets and the Symplicity platform (originally developed by Ardian and subsequently acquired by Medtronic, Inc. [Minneapolis, MN]) a leading candidate to be the first to reach market in the United States, the results of its trial aimed at gaining US approval were among the most eagerly anticipated. In January 2014, Medtronic sent a shockwave through the field in announcing that its pivotal randomized trial in the United States, SYMPLICITY HTN-3, had failed to meet its primary efficacy endpoint. Importantly, however, the safety endpoint was said to have been met. Little was known about exactly which factors contributed to the efficacy endpoint failure, and the data from SYMPLICITY HTN-3 would not be presented until the annual American College of Cardiology Scientific Sessions in March, with a simultaneous publication in a peer-reviewed journal. Medtronic suspended enrollment in SYMPLICITY HTN-4 (a concurrent trial similar in design to HTN-3 focusing on less severe hypertension) as well as trials in Japan and India while it sought to gather additional information via an expert panel review and continued data collection in its global postmarket surveillance registries. In those markets where Symplicity technology had received approval, it was to remain on the market for use at the discretion of treating physicians. Less than 2 weeks after the January announcement, Covidien (Mansfield, MA) announced it would exit its OneShot renal denervation program, while other companies such as Boston Scientific Corporation (Natick, MA) continued with theirs. Physicians and industry awaited the full dataset to determine what led to the missed endpoints— results that would stand in contrast to what had been seen in previous studies that did not include randomization to a sham arm. Key among the findings was the unmet primary endpoint— comparison of in-office systolic blood pressure (SBP) change (from baseline to 6-month follow-up) between the renal denervation arm (n = 364) and the control arm (n = 171). Dr. Bhatt reported that there was a statistically nonsignificant difference of 2.39 mm Hg (95% confidence interval [CI]: -2.12 to 6.89; P = .26), with a SBP reduction of 14.1 mm Hg in the renal denervation arm versus a 11.7 mm Hg reduction in the control arm. In the secondary endpoint (comparison of SBP change from baseline to 6-month follow-up in mean 24-hour ambulatory blood pressure monitor [ABPM]), there was a statistically nonsignificant difference of 1.96 mm Hg, (95% CI, -1.06 to 4.97; P = .98), with a SBP reduction of 6.8 mm Hg in the renal denervation arm versus a 4.8 mm Hg reduction in the control. The company’s previous statement that the trial met its safety endpoint was confirmed, as Dr. Bhatt presented a major adverse event rate of 1.4% (upper 95% confidence bound, 2.9%) in the renal denervation arm, which was significantly less (P < .001) than the prespecified objective performance criterion of 9.8%. The major adverse event rates at 6 months were 4% in the renal denervation arm and 5.8% in the control arm (P = .37). Medtronic has stated that it will continue to support its global hypertension program and provide access to the Symplicity system in those markets in which it has regulatory approval. The company is working to determine the best path forward in consultation with the US Food and Drug Administration, stating that it believes its detailed analysis of SYMPLICITY HTN-3 shows that further clinical investigation is warranted. Studies of the Symplicity platform will also continue to be pursued in other disease states such as atrial fibrillation, chronic kidney disease, and heart failure. In order to better understand the factors that led to the relative successes and failures of the trial and how these might best be applied to current practices and future trials, we spoke to two of its investigators, Drs. Ajay J. Kirtane, and Krishna Rocha-Singh, as well as a keen observer of the impact of study design on results, Professor Darrel Francis. Disclosure: Consultant to Medtronic, Inc.
What are the most important lessons from SYMPLICITY HTN-3? Which factors most led to its failure to meet the efficacy endpoints? Dr. Kirtane: I believe it was multifactorial—any of a number of things could have contributed to the results. The trial was conducted in an extremely rigorous way, but, the challenging patient population and the lack of complete denervation are probably the two biggest factors. And, you could always question whether denervation itself is truly efficacious. However, it’s important to note that SYMPLICITY HTN-3 was conducted with perhaps more rigor than any trial I’ve been associated with personally. Thus, I don’t think the trial should be criticized from a scientific standpoint, but we need to find out more about the procedure itself and the patients that could benefit the most from it. Dr. Rocha-Singh: To me, it is important not to dwell on the idea that this was a “negative” trial. A very important message for interventionists in particular is that there are trials designed to show safety and efficacy, and there are rigorous, prospective, sham-control trials that produce level one data, and this was the latter. But, to the degree that it did fail in meeting its endpoints, we need to fail forward and determine what can be learned from this trial. The first question has to be whether the device worked. As has already been well established, one of the Achilles’ heels of renal denervation is that we operate with dark glasses on—we have no idea as to the effectiveness of what we have done when we leave the cath lab. We don’t know if we ablated any afferent or efferent nerves or the degree to which we did it. It is also important to understand that the study is not over. We still need to see if the untreated patients who did not cross over, those who will continue to be the sham arm, will see their effects dissipate over time. Similarly, will the effect of hypertension control in the treatment group increase over time, such as if you were to move the endpoint from 6 months to 1 year? My suspicion is that there would not be sufficient power to complete that analysis, but it will be an interesting signal to see whether we just missed the time point here. There are also a number of factors related to monitoring and bias that need to be explored, the effects of merely being in a trial at all. 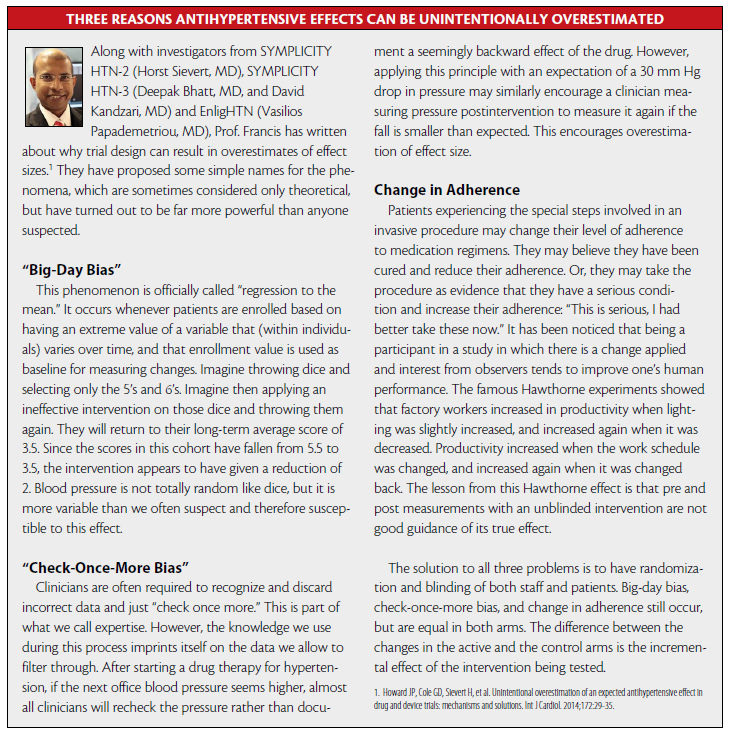 The placebo effect, the sham control, the Hawthorne effect, and regression to the mean are all statistical and trial-related phenomena that we as interventional physicians need to better understand. We are not as accustomed to these types of trial designs as those in other fields of science are. Prof. Francis: Although the trial failed to meet its efficacy endpoints, I think SYMPLICITY HTN-3 was a success. The purpose of randomized controlled trials is to give us reliable answers to our questions, and this one has given us much more reliable answers than the previous data because it is randomized and blinded, which, for the last two decades, we have known is the best way to measure the effect of antihypertensive interventions. SYMPLICITY HTN-3 has taught us that so many “known knowns” were in fact unknown unknowns. We now know that we hardly knew anything at all. I would argue that these data represent the only information we have about the effect size of renal denervation on blood pressure. The real question is, why did we do all these studies with designs such that if they were evaluating a drug, we would be laughed out of town? If I stood up to present a drug trial that was conducted without blinding or a control arm, the audience would throw rotten eggs at me. And yet, I can do that for a device intervention and people will clap politely. We’ve known for 25 years that these elements are needed. Dr. Kirtane: In looking at the SYMPLICITY HTN-3 data, the treatment reductions in blood pressure were not as marked as initially observed in the early experiences, meaning the treatment effect is less pronounced than was previously thought. This is something Prof. Francis, myself, and others have previously stated that we expected to some extent. But, in fairness, there was a far more pronounced effect in the sham-control group than many expected as well. I’m not sure even the folks with tempered expectations could have predicted the extent of drop in the control group. Those two factors, in conjunction with each other, resulted in the trial actually not being adequately powered to show a difference. If this trial had the exact same results but a much larger number of patients, it could have demonstrated a statistically significant difference between treatment and control. Prof. Francis: At first reading, the SYMPLICITY HTN-3 results appear to show no effect, but a better analysis may be that we might now consider it underpowered because we had a completely wrong idea about the effect size to expect. From what I understand, there are groups within the treatment arm that may have responded better. But, it means we have to completely rethink how we do our future studies. We may need to choose our patients and measure the effect size in a more sophisticated way. This isn’t to say SYMPLICITY HTN-3 wasn’t sophisticated—it was. But because it is the first useful data we have, it now allows us to better design future trials. Dr. Kirtane: It is important to mention that the primary endpoint of SYMPLICITY HTN-3 was actually a safety endpoint, and the power calculation was derived based upon the safety assessment. Before this trial, it was not known that denervation was truly safe; it was not known whether the procedure would cause an excess of complications to the kidneys or renal function, etc. Now that we can see that the overall safety (at least to 6 months) is quite good, and obviously we need to follow patients out for longer to truly ensure that, we can potentially start exploring other hypotheses such as medication replacement. Do you consider the inclusion of a sham arm in this and future renal denervation trials to be an ethical concern in any way? Dr. Kirtane: For this particular trial, I don’t think it was an ethical concern at all. At the time this study was conducted, it was unclear to what extent patients would be eligible for the procedure, especially because one could not treat accessory renal arteries or smaller vessels. So, every patient had to have an angiogram, and renal angiography is relatively standard for the workup of patients with resistant hypertension. Because there was only the issue of a minor time delay when the sham procedure was occurring, there was minimal incremental access risk to the patients in this trial, if any. Going forward, we now know that the accessory renals may be important, that they can be treated, and there may be other ways to do the sham. And it’s not about the sham per se, it’s about blinding of the patients, so that they don’t know what they get. There may be other ways to achieve the same effects without actually performing a sham as was done in this study. What are your current impressions of the challenges of medical therapy compliance both within and outside of the clinical trial setting for patients with resistant hypertension? Dr. Rocha-Singh: We know from previous trials and experiences that this population’s compliance and consistency in taking their medications is horrible. They’re not just on antihypertensive medications though—it’s a poly-pharmacy, and it’s unrealistic to expect a person to follow that kind of rigorous regimen on a regular basis. Prof. Francis: I recently received a prescription for antibiotics to be taken three times a day over five days, fifteen tablets in total. I took it “religiously,” and by chance, I was teaching students at the time on the importance of adherence. Yet, at the end of the five days, I still had five tablets left over. How was that possible? I’m a professor of cardiology, I know how important it is, I swear I was taking it, and even I failed to do it. How is a patient supposed to do it? Not for a symptomatic condition, but for an asymptomatic one? Not for one tablet, but a dozen? Not for a few days, but for life? It is very difficult. Sometimes patients have side effects, but sometimes they just get fed up. When they get to the limit of what they can take, I think it’s our responsibility to see if there are other things we can do to help them. For many, there is no point in just saying, “Improve your lifestyle.” By the time they are considered for denervation, they’ve been through all that already. So, we should study the true incremental effect of interventions other than drugs, so we can advise patients wisely. Dr. Kirtane: One could certainly argue the merits of bringing this therapy (if shown to be efficacious) to patient populations for whom medications are unwanted, unwelcome, or not well tolerated. That might be an avenue of further investigation. Prof. Francis: These patients know whether or not they’re taking their pills. If they would prefer to have the intervention rather than take more pills or take the currently prescribed pills more consistently, that’s fine. Why shouldn’t they choose that? We should focus our efforts on obtaining a reliable measurement of the effect size of denervation and offer it to people who prefer it to the option of actually taking more tablets. What do you anticipate the overall effect of the SYMPLICITY HTN-3 data will be on renal denervation use, as well as on future studies? Dr. Rocha-Singh: I think we will not see a similar endpoint pursued with this technology in future trials. If we assume that Boston Scientific remains engaged, we have to first understand that their platform is bipolar rather than monopolar. I suspect they believe they are substantially different in their technology and its efficacy. Their data may be fairly similar, but we don’t know that yet because it hasn’t been published. In any case, they will likely not follow the same clinical trial path. Dr. Kirtane: As far as European practices are concerned, I think there will be a more assiduous up-front assessment of patients than even what has been going on until this point. Many of these patients are already rigorously assessed with ambulatory blood pressures by hypertension experts, but I think these monitoring methods will be perhaps even more stringently employed due to these results in order to ensure that the patients being treated really have no other options. Ultimately, even if the device is only 60% effective, if you’re treating patients who don’t have other options using therapy that has a reasonable safety profile, then it makes sense to do this procedure, because it would be great if 6 out of 10 people could respond. Also, in SYMPLICITY HTN-3, the placebo effect observed demonstrated that patients’ blood pressures were somehow able to be controlled. I’m not advocating doing placebo procedures, but in simply being followed more closely in a trial-like setting, their blood pressures came down, and that’s clinically important. So, one potential application of these findings in places where renal denervation is available is that patients could see an improved blood pressure response simply by being referred to a hypertensive center, with denervation possibly being offered as a last resort. In the next trials, we need to learn more about the procedure’s effect and the patients who will benefit most from it. Bhatt DL, Kandzari DE, O’Neill WW et al. A controlled trial of renal denervation for resistant hypertension. N Engl J Med. 2014;370:1393-1401. Shun-Shin MJ, Howard JP, Francis DP. Removing the hype from hypertension. BMJ. 2014;348:g1937.